Fail locked electric strike, the 118.13 are indicated to install interior doors, this electric strike has a compact design and radius keep. The coil of the 118.13 is multi-voltage between 12 to 24VAC/DC. Model 118W is a compact universal "fail locked" electric strike for outdoor use. A high-quality surface finish ensures it is optimally protected against corrosion. Electric holding magnet with a holding force of 3000N, this magnet is for surface mounted. 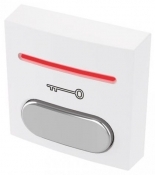 The reference EF300NCTCN has an optical signal (red/green) to indicate the state of the door (locked/unlocked). Mediator is a joint of the multi-point, self locking mechanical lock (629X) and a motorised electric strike (65-24M).